The teacher has said “It’s time you start looking for a real piano and move up from a keyboard. You’ve outgrown this one”. Really? How does that happen? Just 2 years ago you bought this brand new 88 key weighted digital piano and now you’re being told that it will not suffice. They both have the same amount of keys and it has the same touch as a piano. Why do we need to upgrade? In order to answer that question, we need to look at the differences between acoustic piano (traditional piano with strings and hammers) and digital piano (electronic keyboard that you plug into the wall). The two main areas that substantially divide these two types of pianos are dynamic touch and dynamic tone. The concept of touch for any keyboard is fairly straightforward: they all have black and white keys. You push one down, it makes sound. But in reality, the constructs of touch are much more complicated. Remember going to the playground when you were a kid? The see-saw was one of my favourites (especially when your brother or sister is on the other end and you decide at last moment to let it crash to the ground seeing them slightly propel off the end in mid air). Anyway, the idea of balance is realized fairly quickly. We all experimented by moving closer and farther from the middle. 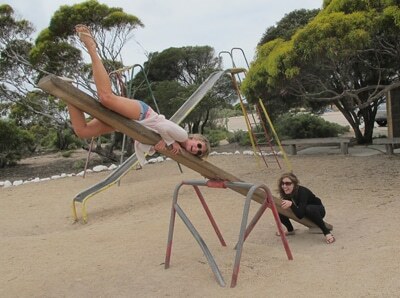 It took substantial weight to push down the see-saw if you were really close to the center. Piano keys are exactly like that. When it comes to upgrading from digital piano to acoustic, one of the most significant changes is a better balance point. What do I mean by that? When you play the piano, the ideal is to have consistency moving from one note to another. But you also want to achieve consistency from the front of the key to the back. Take a look at the diagram with the two different pressure points marked in red. As the demands for piano proficiency increase, you end up using the entire key surface and not just the fronts. 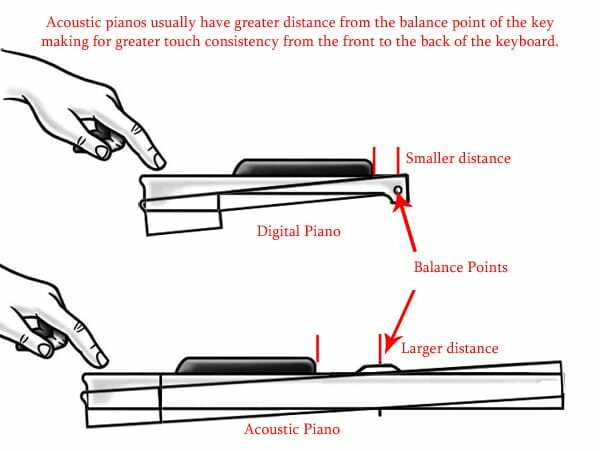 When you look at the cutaway of both digital and acoustic pianos (on the next diagram), you will see that digital pianos have balance points that are too close to the keyboard. It’s like the see-saw principle: the closer you move to the center, the more difficult it is to depress a key. 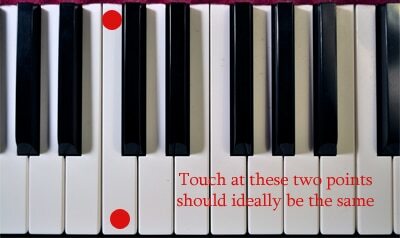 Here’s a test to try: depress a key on a digital piano similar to the red marks on the diagram. Take note to the variance in touch. Digital pianos, by nature of the balance point placement usually have significant touch discrepancy. With acoustic pianos, the balance point distance is substantially further. This creates a more even touch weight from front to back of the key. One sign of a great piano is low variation between the front and back of the keyboard. Another significant distinction between acoustic and digital is the idea of dynamic touch weight. Have you ever gone camping? Good, because it’ll help with this next analogy. Chopping wood requires rotational inertia. The axe handle pivots in your hand while the weight at the end gathers momentum and chops the wood. Due to the multiplying effect of the rotation of the axe head, the power increases substantially. Any seasoned pianist will be able to tell you that acoustic pianos somehow feel different than any electronic or digital piano. The reason for this is due to this rotational inertia of the piano hammer causing dynamic touch. Take a look at the side cutaway of the upright piano. Labelled is the hammer which rotates towards the string. This rotational inertia, similar to a hammer or an axe – gives a very different sensation than the static weight of a digital piano. A digital piano simply raises or lowers lead weight up and down. It doesn’t have a multiplied force when played louder and subsequently, there is no dynamic force on a digital piano. There are many other subtle differences that we could consider regarding touch, but the last one we’ll look at is spring assists. Ever so slight and yet perceptible is the idea of resistance in part by springs in the action. In an upright piano, for example, the pivot point of the hammer we just spoke of not only has rotational inertia but it’s also spring loaded. The spring resists the hammer and at low pressure, low volume, you can feel the spring engaged. 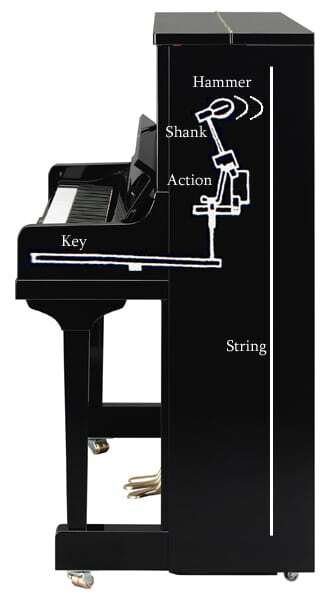 As the hammer moves closer to the piano strings, the tension of the spring also increases, causing more pressure to return the hammer to reset. So why upgrade? Longer keys mean better balance from front to back of the piano keys. The rotational inertia gives dynamic touch changing the feel as you play soft to loud. And finally, the spring loaded joints aid the reset. All of these work collectively to define the touch of a piano. When you compare that to a digital piano where the touch weight is simply raising or lowering a lead weight on a see-saw, the difference is significant. In addition to these touch elements, traditional pianos also have adjustable parts to refine the touch components as well. 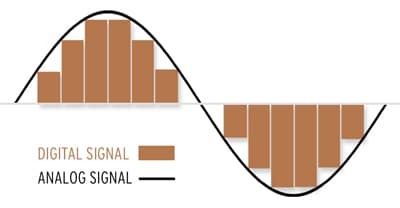 First, let’s look at the comparison between acoustic sound and digital sound. The acoustic piano creates sound by a hammer striking a string. The subsequent vibration is amplified by the soundboard into audible tones. How do digital pianos make sound? Digital pianos don’t actually create sound. They simply play back a digital recording of a real piano. But digital sound and live string resonance are different. Digital sound is made up of many frames per second to give the illusion of continuous sound. Natural vibration of a string is a continuous waveform that we perceive differently. I remember the first time I used Skype to speak with my parents a thousand miles away. My aging father found the technology almost baffling. It was great to see their faces and connect but is it the same as being there in person? No of course not. Both methods communicate effectively but the live version brings about a closer heart connection. A picture of a garden or being in the garden, a filmed version of a Shakespearean play or experiencing live theatre, hearing a recorded version of your favourite artist or seeing them live in concert ~ live is simply more than the digital representation. And yes I’m well aware of the fact that there are incredible creative moments that can only be achieved in the digital realm. It’s not that it lacks expression as its own form. My point is that digital piano will always and only be a facsimile of a real piano. And as it relates to acoustic analog continuous sound waves versus a digital recording of a piano transmitted through speakers, natural sound will always be the better choice. The second concept of sound is the idea of dynamic timbre. Just as acoustic piano touch is dynamic and changes with volume, so too piano tone or timbre changes character with volume. As the hammer strikes the string at soft to loud volume levels, the piano hammer felt is compressed differently. The subsequent tones often go from felty and warm to strident and bright. Depending on volume, other sympathetic tones of the piano also ring. An acoustic piano is not a matter of simply raising or lowering volume but rather, the piano tone changes color with dynamic touch. 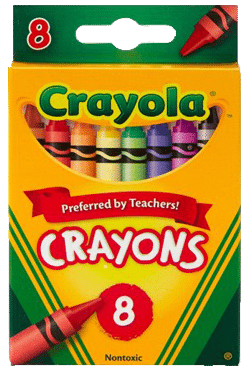 Crayola crayons – remember the new boxes you would get at the beginning of the school year? Digital pianos are a little like that small box of 8 colors. In the recordings of digital pianos (called samples) manufacturers have attempted to capture these dynamic timbres. What this means is that when you play from soft to loud on a digital piano, it transitions through the various colors of samples. But when it comes to upgrading, advanced students need to move beyond the 8 Crayola colors. Advanced playing requires shading, nuances and a wider color palette. You simply cannot hand a student a box of crayons and say “Paint me a masterpiece”. It’s physically not possible. You think I’m being facetious but most manufacturers use less than 4 “colors” per note. Conversely, traditional pianos have an infinite number of colors. And that’s just in one note! When you strike more notes simultaneously, the color possibilities and frequencies increase exponentially. 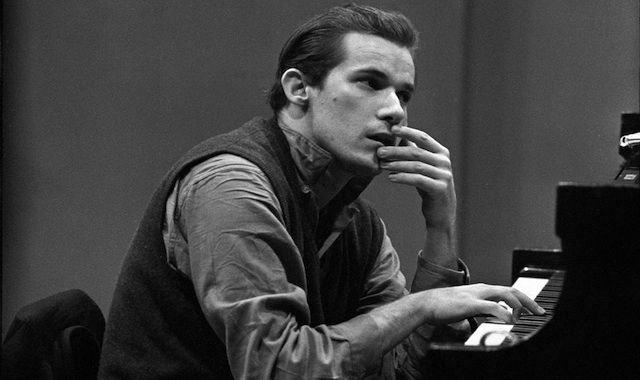 Quite often I think back to the famous pianist Glenn Gould. I read that his parents had to lock the piano after 14 hours a day of playing when he was a child. Obviously he was genius and radical in his approach to piano playing but in reading about his life, it’s apparent that he was completely smitten by the tone of the piano. I fear that we don’t give students the capacity to LOVE the piano for its sound. I wonder if we as parents do a disservice to children by giving them the incorrect tools to begin with. There’s this common school of thought “Let’s get a keyboard and if they stick with it, we’ll get them a real piano”. Do children learning the piano ever fall in love with the tone of a keyboard? Have we lost the connection to analog – this continuous vibration of the strings? Does it resonate with us the same way? Have we given them a handful of colours and limit the pure enjoyment of limitless expression?